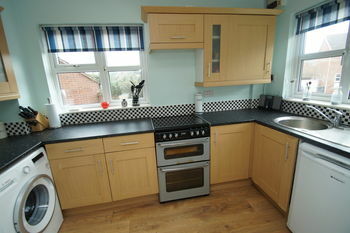 A two double bedroom, semi detached house. Occupying a popular location in Walkwood. On a corner plot with gardens to front and side, the property is well placed for access to schooling, parks and play fields, community centre and good road transport links to surrounding areas. The layout comprises: Entrance hall, being open to a fitted kitchen, having slot in oven, inset sink, wall and base units and plumbing for appliances. 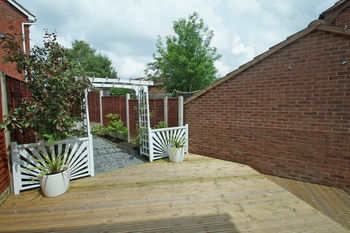 Excellent rear lounge, with wall mounted fire to wall and French doors leading out onto a rear garden. This is laid mainly with replaced decking and gravel, having some shrubs to borders and pretty arch with decorative fence panels. 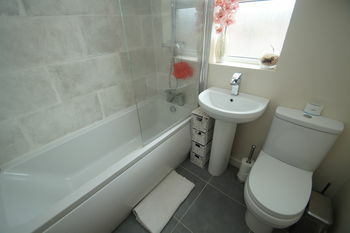 Upstairs offers a modern bathroom with mixer shower over the bath. Bedroom one to the rear and bedroom two featuring a cupboard and fitted wardrobe. A separate single garage is set to front behind a 2 car driveway, with a gate to a suntrap courtyard garden between the main house. Benefits include: Double glazing and central heating system. 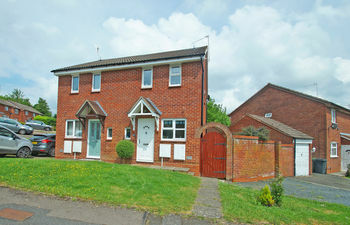 A rather pleasant property which may attract first time buyers.